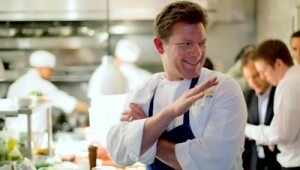 Celebrity chef Tyler Florence, a Food Network host, cookbook author and restaurateur, has just been served a lawsuit by his former business partners. They claim that Florence "bailed" on them and their investment for a new restaurant venture. The plaintiffs (Michael Musleh, Hani Musleh, Martel & Nabiel, Inc., and DBA HLC Enterprises) were once Florence's business investors. According to the suit, they provided the financial support for a new high-end restaurant in San Francisco called Bar Florence. The preparations for the American cuisine restaurant were well under way for about a year -- and then the landlord defaulted on the project site's lease. At that point, Florence abandoned the project. Eric Miller, the attorney representing the plaintiffs, said that his clients invested over $175,000 in a restaurant that will never be a finished product. "They were partners, and essentially Tyler pulled the plug," he said. An additional part to the lawsuit involves Wayfare Tavern, a restaurant Florence recently opened successfully in San Francisco without the help of the plaintiffs. It's reportedly "doing quite well," according to Miller. Thus, the plaintiffs claim that their investment capital played a big part in Wayfare Tavern's success -- and now they want payback, a piece of the action. "We view it as he was a partner in our deal, and he moved the deal down the street," Miller said.